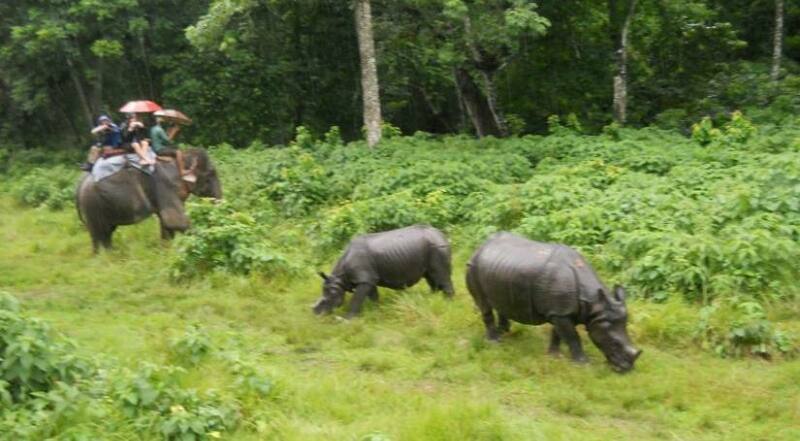 Chitwan National Park is located in the subtropical Inner Terai lowlands of south-central Nepal in the Chitwan District. It is the first national park in Nepal established in 1973 and listed in a World Heritage Site in 1984.Chitwan means literally the heart of Jungle. The Chitwan National Park offers a wilderness of rich ecosystem that includes mammals, reptiles, birds and many others. This is one of the most popular and most visited oldest national parks in Nepal. There are about 526 birds, 600 plants species, 49 amphibians, reptiles and 50 mammals inside the park. The park is famous for one-horned rhino and royal Bengal tigers, which are endangered species animals. Besides that, wild dogs, wild cats, languor monkeys langur, deer, leopards and wild boar. The endangered amphibians Gharial, Mugger crocodiles and different kind of reptiles including python can be seen in the park. The forest is alive While winter birds include waterfowl, Brahmi ducks, pintails, bar- headed geese, cormorants and migratory birds from Siberia, during summer with the arrival of migrated birds paradise flycatcher, Indian pina and parakeets. Chitwan National Park offers many different activities such as jungle walk, jeep safari, canoeing, elephant safari, elephant bathing, bird watching, sunset from the Riverbank, Tharu cultural walk etc. The Tharu cultural dance is very knowledgeable and meaningful while showing their typical stick dance, Jhamta dance, Peacock dance and more. Today, your naturalist guide takes to you for jungle walk, canoeing, elephant bathing centre, elephant breeding centre similarly jeep safari while you can see one horned rhino, deer, birds and mammals inside the jungle. In the evening beautiful sunset makes your time fantastic in the bank of Rapti river. You will back to your hotel for dinner then enjoy local Tharu cultural programs. Overnight in hotel. Early in the morning, your guide takes you near the Rapti river for bird watching and you will back to the hotel for breakfast. After breakfast, you will drive to Kathmandu about 6 hours and you will be dropped in your hotel then rest of the time is free. Overnight in hotel. You have free time today so you can go shopping such as Pashmina, Thangka, Lokta paper, Hemp products, Khukuri(Nepali knife), woolenMetalwares, wooden carving, rudra woollen carpet, Mask Jewelry and gems as souvenirs. In the Evening Himalayan Joy will host as a farewell dinner in the typical Nepali restaurant. Drive back to the hotel.